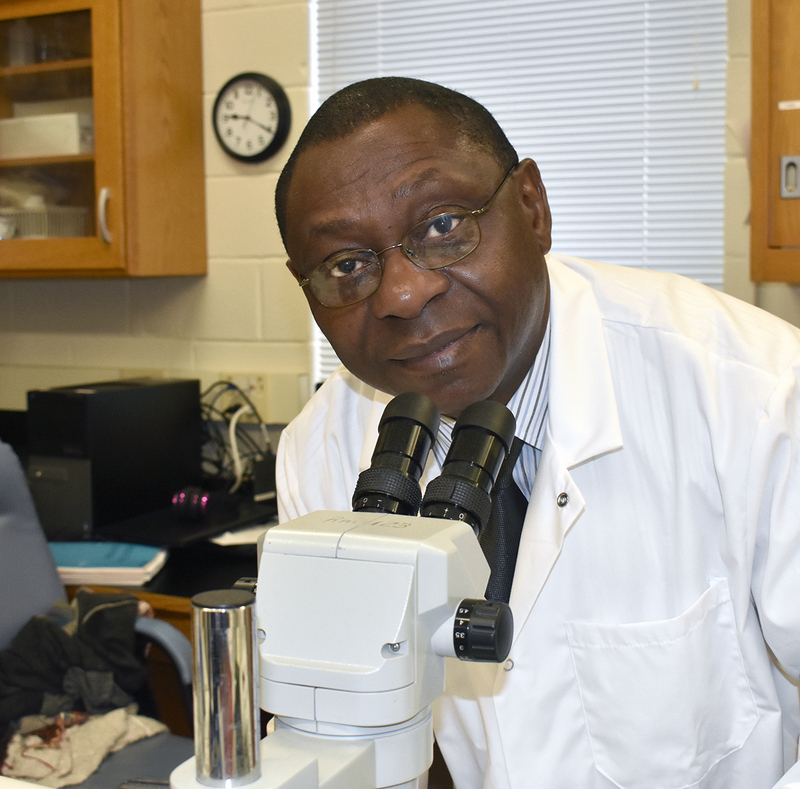 Dr. Akingbemi is investigating the effects of soybean isoflavones on male reproductive track-development, which is a continuation of research he has conducted since 2009. Soybeans, considered to be a nutritious and good source of dietary protein, may have unwanted effects as well, and scientists are questioning some of the long-term impacts they might have on hormonal activity—particularly in males, according to an Auburn University professor. Dr. Benson Akingbemi, a professor of anatomy in the Department of Anatomy, Physiology and Pharmacology in the College of Veterinary Medicine, is researching that possible connection through a new three-year $450,000 grant from the National Institute of Environmental Health Sciences of the National Institutes of Health. He is investigating the effects of soybean isoflavones on male reproductive tract-development, which is a continuation of research he has conducted since 2009. His latest NIH grant will enable a number of undergraduate, veterinary medicine and graduate students to participate. Isoflavones are chemicals found almost exclusively in the bean family, with soybeans being the most common source in the human diet, Dr. Akingbemi says. Numerous studies associate soy-based diets with possibly reducing the risk of breast, prostate, colon and certain types of skin cancers. Isoflavones achieve their cancer-fighting ability by mimicking and regulating the body’s levels of the female hormone estrogen. However, in recent years, scientists and medical professionals have become concerned that heavy soybean consumption among men may also have a negative side to otherwise beneficial health effects, which has been articulated in several scientific and press publications. In the past several years, the NIH has funded research to help shed light and to increase the scientific and medical understanding of biological effects associated with consumption of soy-based food products, Dr. Akingbemi says. Titled “Xenoestrogen regulation of Leydig cells,” the long-term goal of Dr. Akingbemi’s research is to achieve four objectives: identify vulnerable segments of the population; identify biomarkers of exposure to isoflavones; determine the molecular basis for permanent effects from exposure to isoflavones; and facilitate development of strategies to mitigate exposure effects. Dr. Akingbemi, an expert in reproductive endocrinology, is particularly interested in the long-term and possibly permanent effects that soy-based diets may have on infants and males. While he notes that the NIH supports soybean studies in other areas, including nutritional and cardiovascular effects and effects in other organ systems, his research will investigate isoflavone effects in the male reproductive tract.